darn rain. love it, but not when i plan to go to a show. weather guys can't call the weather right either. stupid idiots. anyway, i tried to stop at hooters on friday night...no rain, as was previously predicted...apparently no real show. not the first time either. think i'll stop trying this friday night show anymore. there were two cars over by the tommy's burger, very nice, but i didn't feel like setting up without asking if the owners minded—and i assume they were having a burger and wondering where the hell the other cars were, just like me. would have stopped again at hooters for their monthly show today, but by the time it would've/should've started, the rain had finally arrived. and it poured. so, pfft. so now, i'm going to just play with my cars all evening, since my better half needs to get some work done, and i apparently distract him, so i'll leave him alone in the other room. 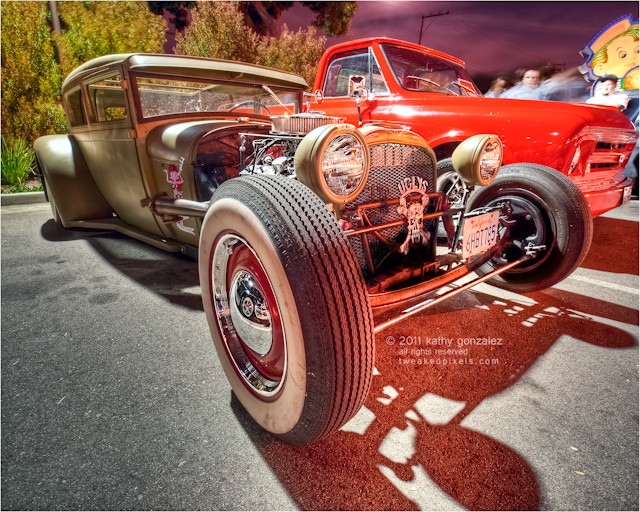 here's a rat rod i saw a couple of weeks ago at the broiler. sun really is setting early by the time i get there now. doesn't bother me; just the people that get in the way, walk through the shot, and aren't polite enough to move out of the way. at least these people were on the other side of the truck in this shot; they'd already messed up a previous shot, and were heading back this way, so at least i got one ok pic. they couldn't hear me yelling "numbnuts" and worse under my breath, which is probably a good thing.